The trails have been packed but not trackset. They are skiable. Check out the photos. We are desperately hoping for snow, although this long fall has helped with getting some of the outdoor chores done. We have been informed by Grey Sauble Conservation that a logging operation at the north (back) entrance to the Massie Hills Trail has run into a bit of a snag in that it is too sloppy wet to get their logs out. We are told that once the ground hardens up with the frost they will need seven to ten days to finish up. Until that time the back entrance is closed to all traffic including our trail grooming equipment. There is no impact to access from the main entrance and a majority of the trails are still available. 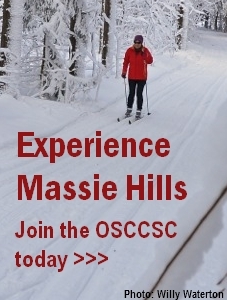 We are taking this in stride as the Massie Hills are a shared resource and we need quite a bit of snow before we can groom the trails in any event. We anticipate that the logging operation will wrap up with minimal impact on our ski season. Thank you for your patience, we will keep the membership up to date as the situation develops.